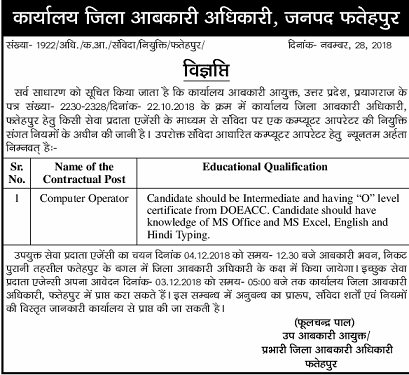 UP Abkari Vibhag Computer Operator Recruitment 2019 | Apply For Excise Department Data Entry Operator Clerk | Office of Jila Abkari Adhikai | UP Abkari Vibhag Fatehpur Recruitment 2019 | UP Abkari Vibhag Latest News Update. 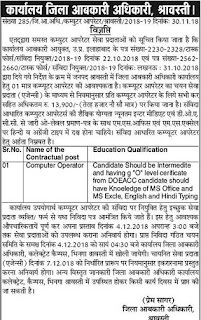 UP Abkari Vibhag Computer Operator Recruitment 2019 Through Medium of outsourcing agencies application are invited to fill Computer Operator Jobs in Fatehpur District Office. The Main head office of Abkari Vibhag Pratapgarh, Kaushambi, Handia is located in Prayagraj (Previous Name was Allahabad). Prayagraj Letter number 2230-2328/dated 22 October 2018. On Samvida Basis Computer operator 1 posts will be filled. if any agencies interested to make bid than they can apply to address. Some Eligibility Criteria regarding Computer Assistant in Excise department provided below. Abkari Vibhag Gonda Recruitment 2019: Latest News computer operator vacancies on contract basis in Excise Department of Gonda check here pdf download abkari Vibhag gonda computer operator Recruitment 2019. 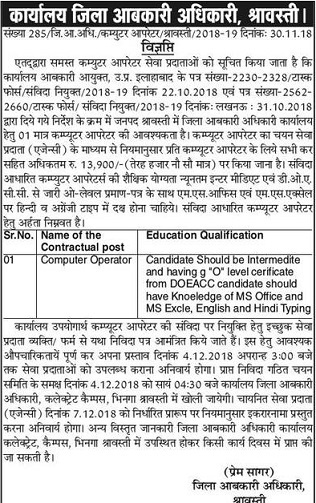 UP Abkari Vibhag Computer Operator Salary is Rs 13,900 Per Month. Intermediate DOEACC A Level or above certificate is mandatory. Total Number of vacancies is 100 above. how to apply: Interested and Eligible agencies who are eager to file the samvida vacany. They should apply before last date of application form which is 3 December 2018. You can also ask type of recruitment in excise department, whether more vacancies are their for computer operator jobs are not or how many year computer operator will be working. Name of the Contractual Posts: Computer Operator. Educational Qualification: Candidates should be intermediate 12th pass and having “O” Level certificate from DOEACC. Typing Test: candidates should have knowledge of MS Office, MS Excel, English and Hindi Typing. Selection Process: Type Test in English and Hindi Mode. Result: For More details and how to fill computer, data entry operator, junior assistant posts we will published soon.